How I Iearned what the scrimmage line was. Who? Brett Who? Thank you my fellow FSM Forum Members. Your partake on my Super Bowl 53 thread was an interesting study on the human psyche. How strong we feel for a particular team, player, or coach. Sometimes things within us forget that this is just a game and not to be taken too seriously. I for one did not really enjoy this years Super Bowl 53. It was slow at best. Maroon 5 was just ok. And I enjoyed only one commercial of where there were several cameos of past Hall of Fame players and soon to be Hall of Fame players at a dinner ceremony with the golden football that destroyed the dinner event. That was not only the high point but absolutely hilarious at best. My favorite part was Terry Bradshaw tossing the ball to Franco Harris. How crazy is that? I also laughed when Tom Brady showed off all of his five Super Bowl rings with Baker Mayfield. On an interesting note, I’m a fan of all 32 NFL Teams. The Cleveland Browns in the past decade if not longer were terrible at best. It was an interesting ride as I live in Streetsboro, some 35 minutes from down town Cleveland. Many times I was asked why I was not a Browns dedicated fan? Again, my answer was I am a fan of all 32 NFL teams. Like modeling, I am a novice as a fan of the NFL. I only went to a few Streetsboro High School games with Mrs. Toshi some 15 years ago. At the game, I had no idea what was going on as I never watched nor played in any sports. Too busy playing music! I would have to ask Mrs. Toshi what was going on. Then at half time, I would run away to get some coffee. I would meet many other parents and mingle with them. Although there were a group of fathers close to the end zone that I would talk to as well. They were my Hillbilly friend’s. I lived in Streetsboro long enough to be a Japabilly. Lol! It was these great men that helped me understand the game of football. They kept telling me over and over again that I needed to either watch college football or watch an NFL game. So here I was sitting in the living room waiting eagerly for a NFL game to start. I figured I’d be in a better mental position by watching pro-football instead of college football. Then all of a sudden the game starts with boos directed to an elderly gentleman in a purple uniform with the number 4 on his jersey and horns on his helmet only to be followed by cheers from fans with what looked like cheese on their heads. I was shocked. Why boo the old guy and cheer for the other team. How unsportsmanlike conduct. Well, half way through the game I realized that the old man named Brett Favre was throwing touchdowns after touchdowns against his former team. This was a Vikings vs Packers game in Lambeau Field. I was in awe of the sportsmanship of Brett Favre. Not only did the Vikings win, he gave a heartfelt outcry of how he was still a Packer and in his mind a Packer for life saying this in tears on national TV on a Sunday prime time game. So I followed the Vikings or more so Brett Favre that season of which he took the Vikings to a NFC Championship game against the New Orleans Saints. I will never ever forget how exciting that game was. It was touchdowns after touchdowns. In the end, Favre having been beaten up pretty bad yet the ole gunslinger stayed in there threw an interception that ended the Vikings season. looking back, that was the most exciting game I ever saw, it was just amazing. That game topped the Super Bowl that year between the Saints and the Colts. I think it would have been a better match up and a historical game with the sherrif and the gunslinger. If that happened, of course I would have Favre crush the Colts. So I studied, researched, watch everything that was NFL! And loved it to the point in which I started to collect football cards. I have 90% of Favres rookie cards. One card has his only authorized signature. On my most expensive Favre rookie card is his most known Stadium Club card. He’s in a forward running motion in his Atlanta Falcons uniform of whom drafted him. This card is worth a couple of bucks unless it has a embossed Super Bowl symbol in it‘s far top right hand corner, then this is the “White Whale” of Favre‘s rookie cards. My card of which is a Beckett Certified item is worth $600.00. So then I started to collect rookie cards of QB’s that I enjoyed watching. To date, I have rookie autograph cards of Peyton Manning, Andrew Luck, Russell Wilson, RG3 (a bust yet it was fun watching him take the Redskins to the playoffs in 2012), Johnny Unitas, and I’m now saving money to get a Tom Brady autograph rookie card. I do have a Brady rookie card, but that’s it. Anyway, here’s my road to the love of NFL Football! Having had collected baseball cards from the late 80s to mid 90s, I know what it’s like to go after ”chase”cards, or exclusive, hard to find baseball cards. Nowadays, the market has gotten so saturated and expensive. With so many baseball card companies out there, it’s not worth it nor cards nowadays are a safe bet when it comes to value. Collecting baseball cards is like playing the stock market - you might see a rise then a crash. RG3 autographed rookie card is most likely worthless now. I’ve seen it all happen before. Why? Too many cards companies. Current baseball card packs can run you anywhere from $5 or higher for the top of the line pack. And you get 6-10 cards per pack. If you don’t find what you’re looking for, you buy another. Kinda like gambling but worse. Read the fine print on the back of the wrapper. The odds of acquiring an autograph card in a pack is exactly the same as buying a lottery ticket with hopes of winning $50,000 scratch off. Oh sure, you can go to a baseball card shop but the shop owner is going to charge you more than what the card is valued in the Beckett Price guide. But wait... there’s more. Some shop owners will sell fake autograph cards. Yup... I’ve known a couple dishonest shop owners selling fakes in my days of collecting. I’ve even seen “searched” sealed packs because I know what to watch for. What I mean by that is dealers will carefully open the packs, search them, pull out the expensive cards, replace it with a common card and seal it back up to sell to the public. Don’t get me wrong, I loved collecting MLB, NFL, and NBA baseball cards. It’s just now the card companies are putting out far too many card brands and offshoots of their brands, it made collecting not fun anymore and very expensive. My advice when it comes to getting autographs? Don’t get the cards, instead get a signed photo, football, baseball, or bat. They hold more value than any autographed baseball card. Oh yeah... make damn sure it comes with a certificate that the autograph is real. And don’t order or buy autographed cards, photos, balls, bats through the mail or eBay/Amazon. There’s no telling if they’re authentic. Better yet, attend a show or autograph signing session. Be prepared to spend top dollar for autographs. Photos aren’t usually that expensive but balls and bats do carry a premium. This way you know you had him sign your photo, ball, or bat. I too am a fan of football. Only two teams I dislike, the Raiders and the Cowboys. My college (Hofstra University) was once the home of the NY Jets. They would often make available home game tickets to lesser visiting team games. For instance, no tickets for Miami when Marino was QB, but if the Colts or Pats were in town, you'd be able to get tickets and a school shuttle bus ride to Shea Stadium in Queens. Brett Farve was a great player. Didn't fair so well in Atlanta, but became legendary in Green Bay. Do you have cards from his short career with the NY Jets? I'll forever be a Pats fan, and have a fondness for the Steelers. They were such an awesome team in my youth as well as beating the Cowboys and Raiders (Immaculate Reception game was against the Raiders IIRC). The NFL 100 commercial was the best Super Bowl commercial, followed by the Bud Light knight getting killed by the Mountain that Rides from Game of Thrones just before one of the dragons toasts the entire tournament. I played football in high school and junior high school. I wasn't very good, but loved it. I doubt I saw more than a few minutes of playing time my freshman year, but by my senior year, there were games I never left the field. Mainly due to a shortage of position players. I stay in contact with many of my high school football teammates. 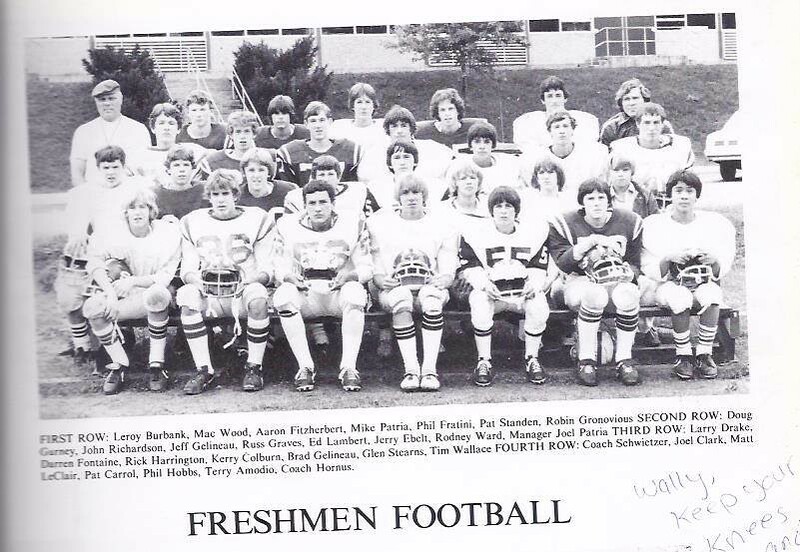 As a treat, here is my freshman football team photo (summer 1978). I'm in the front row, far right. They even misspell my last name like most people do. The football coach in the last row, upper left hand corner, is indirectly responsible for my military career and probably my entire adult family life. Coach Bob Schweitzer was a 5th grade teacher who was also the high school wrestling coach. He hounded me to join the wrestling team. I relented when I got to junior high school and started wrestling. I was pretty good and stuck with wrestling throughout junior high school and high school. I got a varsity letter all four years. My coach was from Long Island and wrote a letter to the wrestling coach of Hofstra University. I went to that school to wrestle. The college housed the wrestlers and ROTC cadets on the floor where handicapped students lived. The thought being that when there was a fire, the cadets and wrestlers could assist in carrying down the students not physically able to make it down the stairs. An ROTC cadet next door to me convinced me to join. I enjoyed ROTC and eventually enlisted in my local National Guard. I did well enough I received an active duty commission. I was discharged one day and commissioned on active duty the next. During my first tour in Germany, I ended up deploying to the desert and then returned to Fort Knox in 1991 for my Armor Officer Advance Course. I met my wife at a Halloween party in Louisville that year and we were married a few months later (27 years in April). I ended up with almost four years in the Guard and just over 24 years of active Army service (28 years total service). Had I not joined wrestling, I probably would not have chosen that college in New York, may not have joined ROTC nor have met my wife and had my children. My life may have had a totally different path. All this because a 5th grade teacher convinced an 11 year old to join the wrestling team. He passed many years ago. Someone from my hometown Facebook page, put out a call for any memories or stories and I submitted basically what I posted above. They hold a wrestling tournament in his honor each year. My story is one they use. Incidentally, the assistant coach in the upper right hand corner passed away this past year. This was the last year that man was a football coach. He started a cross country team the next fall. Many of us ran a race that year for him. While the winner of the race was from the cross country team, the next 9 runners were members of the football team that ran just to support his race. He was well liked and taught Western Civilization (aka history) in high school. He did not like being referred to as "coach" and if you did, he'd call you "player." It's odd, the things you remember. Thank you for taking the time out for replying to my thread. I’m most honored. Yes, saturated is an understatement! Lol! Did you know Topps card company has lost it‘s ability to print any NFL cards? Panini a European conglamorate has taken over the NFL Franchise. I was heart broken as some of my favorite cards were Topps. I really enjoyed Prime and Chrome cards on the low end side that Topps produced. On the high end I was in love with several Topps products. I just enjoyed the design of chrome so much so I purchased complete sets of 2012 Chrome. That year, they had the Tall Boys style card that Topps produced in the past. I had to have the complete set of that as well. Like any hobby, it takes time, effort, and money. I went into collecting football cards in 2012 when Andrew Luck was drafted by the Colts as a first round pick. Of course I was an immediate fan of Andrew Luck. My very first autographed card was a Panini Black Box Andrew Luck Card pulled by Mrs. Toshi. It was Mrs. Toshi that pulled all of my auto cards from hobby boxes, she had a golden touch. She would just pick a hobby box then pick out a pack(s) with the hit in it. We really enjoyed collecting football cards that year. It was a family affair as my daughter and her boyfriend would come over and we would open hobby boxes that Mrs. Toshi would purchase. It was a wonderful time in my life as I just suffered my TBI. I wasn’t chasing any hits, I was just enjoying doing this as a family. I don’t purchase hobby boxes anymore as it was an expensive endeavor. But occasionally, I’ll purchase a blaster box from Walmart just to keep in touch with collecting cards as a whole. My last hit came from a card store owner that was selling a special box from the card show. It stated on the box that it was an authentic product and was featured at the show. In it was a 1/1 card. The dealer sold this box for $75.00. Mind you, it came with only one certified card. Guess whom I pulled? It was none other than a 1/1 Brett Favre card. I was esctatic! To my fellow members here, a 1/1 card is a extremely rare card as there is only one card like it in the whole world. I also pulled a rare card of Deion Sanders when he was playing a bit part for the NFL Network, he called himself Leon Sandcastle. Well the bit part was so well received, Panini produced 12 cards of Leon Sandcastle autographed cards. I happen to own 1 of 12 of this card. As for a card show, I went to my very first card show at the IX Center here in Cleveland right next to the airport. It was there that I saw in person the extremely rare Honus Wagner card. It was selling for $250,000.00. It is called the Chesapeake Wagner card. I also got to meet Jim Brown of which he signed a rookie card of mines. I purchased a hobby box, several cards of which I really liked or were cool looking. In my hobby box, I pulled another Andrew Luck certified auto card. This is where I got my Johnny Unitas auto card certified by Beckett. I collect stamps, coins, and football cards. All of which can be inexpensive or astronomically crazy in cost. I choose to collect what catches my eye. If I were to chase a card, stamp, or a coin, I’d go crazy! Lol! For now, I’ll stick with modeling with my grandson Ezra. After my accident and Mrs. Toshi’s tumor situation, I‘ve come to the realization that life is precious. You can’t live life to the fullest nor as if it’s the last day of your life. Then if that was so, everyone would not go to work, brush your teeth, and eat whatever they wanted to. The realization is to be kind and considerate to your fellow human being. That‘s very cool as you can always enjoy watching an NFL game and not get all caught up in it. As for the Raiders and Cowboys, I really enjoy “Chucky” Coach Gruden. I’m anxious to see how well his return to the NFL will be. I like watching ”Zeke” Elliott run the ball especially since he is a OSU ulumni and Dak isn’t all that bad as well. I’m a huge Tony Romo fan now that he’s a commentator. He’s better at that than when he was the QB for the Cowboys. Lol! No in all seriousness he’s my current favorite commentator. Yes, I happen to have a set of Favre cards as a Falcon, Packers, Jets, and a Viking. I really miss watching him play, he was so exciting. It is said that even the haters of Favre would watch his games just to see if he would throw an interception. I for one would watch him no matter what. I can’t find a QB that gets me that excited anymore. Sure, Drew Brees is a monster and so is Tom Brady. And I enjoy watching them both. But there will never be another Favre. As for your Steelers, I have a Big Ben rookie card and a Troy Polomalu rare rookie card as well. I’ve seen footage of Terry Bradshaw playing but I can only currently enjoy him as a commentator as I’m a novice at football. Thank you Rob Gronovius for sharing your past with me and Forum members. Your very colored past is exciting! All the best to you and I’m honored that you would not only share your stories but include a photo of yourself as a football player. Tony Romo was frustrating to watch as a fan. He could literally play a hall of fame worthy game for 59 minutes and then lose it with one bad throw. Great ccommentator though. I wonder if one of the NFL statiticians could come up with a number of games he lost due to one bad play he made. Raiders were such a dirty team back in the day with unnecessary late or hard hits and the Cowboys were billed as "America's Team". I'm an American and they're not my team! Lol! That is so true. It would seem that the Cowboys under Tony Romo would just win a game until (As always) some mishap would cause the Cowboys to loose. As a commentator, he’s been called Tony “Nostradamus“! He will call the play and execute the timing before a snap. Too bad he couldn’t do that as a QB! Yes, I agree. The Raiders were a dirty team. “Lyle Alzato’ anyone? I saw old footage of the Raiders back in the day and a lot of what I saw is now not allowed currently in the NFL. As for Alzato, he did get a ring for Super Bowl in the 1983 season. He was one of the first athlete to come out with anabolic steroid use. He died of a brain tumor, he said the the steroid use caused his tumor and his demise. Another dirty player is Suh. Although after being castigated by Roger Goodell, he’s now playing at a proffesional level. “Suh, stomping on a players head”. That was it for Suh. Yeah, Roger Staubach,Troy Aikmen, and lets not forget Emmitt Smith. These men are just a handful of players that took the Cowboys to the Super Bowl creating a dynasty. I only can surmise (Since I was not into football back then) that the title of “America’s Team” was a term given to them by fans and of course Jerry Jones. To date, I don’t personally feel that they are “America’s Team”. That term must be earned once again. I know there are haters as always out there of the Patriots, but they earned in all complacencies, the Dynasty tittle. I have a lot of respect for the Cowboys, good organization whose owner needs to get into the 21st century and get his team back on track. I remember being stationed at Fort Hood in the 1990s. On I-35, there was a town called Troy, Texas that would change its name to Troy Aikmen, Texas during the football season. The Cowboys had some oustanding teams those years. But the owner will forever be known as the man who bought the Cowboys and turned around and fired Tom Landry, by announcing a new head coach. That's really not how you fire a Hall of Fame coach and the only coach the team ever had. Tom Laundry is and still is one of the greatest coaches to ever live. Lombardi, Laundry, Bellichek, etc. He was in a class all by himself. Also classy with his hat and suit. Being a novice on football, I can only speak in terms of film reels of the past. So thank you for enlightening me with this great game we call football. Being a fan of football, this Saturday and Sunday at 8:00pm, there will be a football game on the NFL Network. It’s called “Alliance of American Football”. I’ll be definately watching both games to see what’s it’s all about. How about you? let me know. I've been following AAF, nearest team is Memphis. I followed NFL Europe briefly as well. It's more like minor league football with players that didn't get into NFL programs. No kick offs, making it even less a game of the foot. Maybe I'll check it out and see,but I have trouble focusing on anything other then the NFL,but im sure I will check it out,and who knows.The only other league I enjoyed somewhat was Trump's USFL in the early 80's,did well until he tried to go head to head with the NFL.A lot of good players went to the NFL when they folded. I have seen a couple of games of the AAF. It wasn’t bad but not great. I do remember USFL. Thank you for the reply.